Today is National Breakfast Day, so I’ve decided to dedicate today’s National Nutrition Month daily post to my favorite meal of the day. Everyone’s heard that breakfast is the most important meal of the day, but is it really? Actually, yes it is. Research shows that people who eat breakfast get more fiber, calcium, vitamin A, vitamin C, iron and other nutrients versus those who do not, giving breakfast eaters a greater likelihood of meeting their daily nutrition goals. 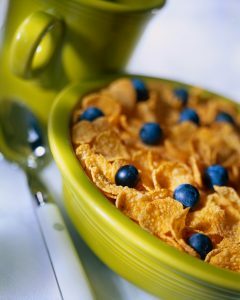 Sadly, breakfast eating is on the decline, with 20 percent of Americans skipping the morning meal altogether. Grabbing a bite in the morning needn’t be time-consuming or an elaborate affair. While I don’t often advocate eating on the run, if that’s the only way to ensure you’ll get nutrients in your belly, I say go for it. What are your breakfast favorites?